Mobile phone video released on the internet shows the male fan rushing towards the Canadian singer who was sitting at a piano on the edge of the stage. Security guards tackled the young man from behind, spilling into the 19-year-old pop star and tipping over the piano. 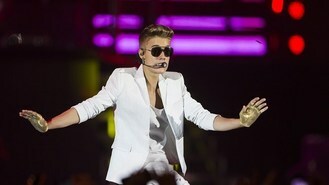 Justin twisted away and then strolled off stage while the guards dragged away the fan. The concert on Sunday - the second of a two-performance stand in Dubai - resumed after a short break and Justin appeared calm and unharmed. He later tweeted: "Dubai. Nothing stops the show."